The fan-favorite Frappuccino, the Caramel Cocoa Cluster is back! Find it at your local Starbucks April 5th through April 11th, in both US and Canadian Starbucks locations. The Caramel Cocoa Cluster Blended Frappuccino Coffee beverage is here on the Starbucks nutrition page. My recollection is that when this drink was introduced in June of last year, it used a dark caramel sauce. The official newsroom story on it is here, describing it as, “A blend of toffee nut syrup, Frappuccino® Roast Coffee, milk and ice and topped with a layer of dark caramel sauce, finished with whipped cream and a drizzle of mocha sauce.” Of course, I hear gossip that dark caramel sauce will be making a come back this summer. 😉 However, when you order this drink April 5th – April 11th, your store will use the delicious regular caramel sauce available for your Frappuccino. Enjoy your special limited edition Frappuccino! Here’s another sweet surprise: From April 5th through April 11th, the Starbucks Sweet Receipt offer returns. Customers can bring back their morning receipt after 2 p.m (same day receipt), and purchase any bakery item for $1 at participating Starbucks stores in the U.S. When coconut is here at Starbucks, you know it’s sunny out! Starbucks Elevates the Iced Coffee Experience: Cold Brew Begins 3-31-2015! I haven’t touched a Frappuccino in at least 6 months. 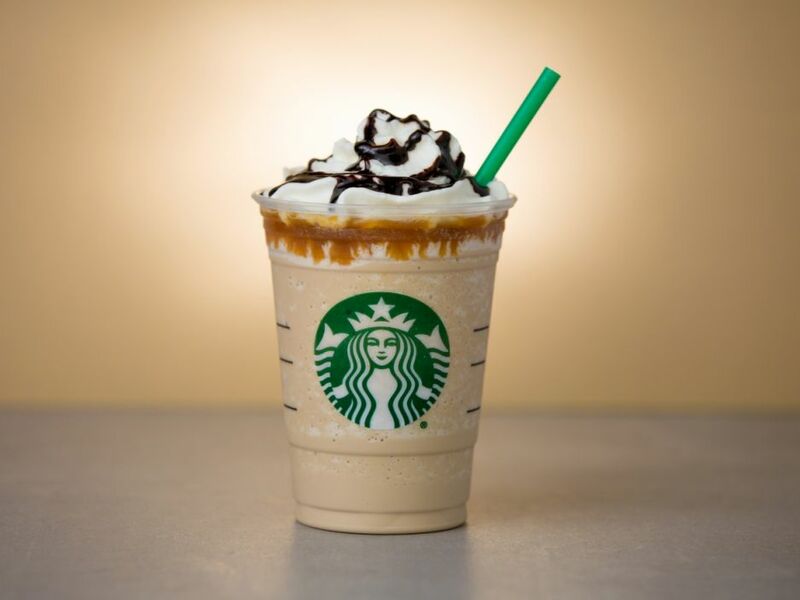 Looking at the picture of this Frappuccino, is like torture for me. Darn that looks good! 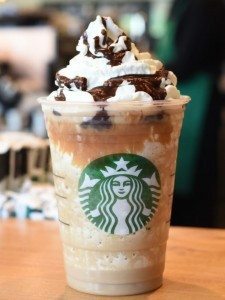 I’m not a big Frappuccino fan myself… This one is a favorite with my kids. I’m so glad the mini Frappuccino is back. This is a perfect size for my kiddos for their occasional treat, and when we forego the whipped cream the calorie content is no too bad. @Lisa – The “mini” size is back???? I haven’t seen that in Seattle. Is it a regional size this time around? Would you send me as many pics as you can of the mini size? Is it on the menuboards in your area? I saw yesterday that the cluster would be returning today. Maybe I will swing by after lunch for a treat! @Melody, I missed getting a picture of the menu board. If you want that I can look tomorrow morning.